What actually is Pluto? Is it a planet or just another trans-Neptunian object (dwarf planet)? The uncertainty over Pluto’s planethood is without a doubt one of the most flaring issues among researchers and space fanatics. Scientists have been arguing on how to classify Pluto accurately for more than a decade now. Pluto was discovered on February 1930 by American astronomer Clyde W. Tombaugh and was soon granted the status of a planet, thus becoming the ninth planet of the solar system. In 1931, about one year after its discovery, a group of researchers estimated Pluto’s mass which turned out to be quite similar to that of the Earth’s. Then in 1948, planetary scientist Gerard P. Kuiper conducted his own research but this time Pluto’s mass was about 1/10 of the Earth’s. Two more separate studies were done in this field and both the times Pluto’s estimated mass was bought down drastically. By 1992, a bunch of new trans-Neptunian objects having Pluto-like characteristics was discovered. A major turning point in this matter occurred in 2005 when a group of researchers discovered a more massive trans-Neptunian object called Eris. It was around this time when Pluto’s planetary status was questioned. This discovery started a heated debate among the astronomical community on whether to designate Eris as the tenth planet or reclassify Pluto as a dwarf planet. A decisive step was finally taken in August 2006, when IAU or international astronomical union passed a resolution of a sort. According to this resolution, there are three conditions which a solar system object has to fulfill in order to be considered a planet. The object must have cleared the neighborhood around its orbit. As you can see, Pluto fails to meet the third and last condition. Its mass is considerably less that of all the other objects in its orbit combined. Furthermore, IAU panel decided to re-classify bodies which meet the first two conditions but not the third, such as Pluto, to dwarf planets. Thus far only five dwarf planets have been identified namely, Ceres, Pluto, Eris, Makemake and Haumea. The definition introduced is fundamentally flawed. As a scientist, I’m embarrassed. Alan Stern to New Scientist. Stern went on and argued that by the new definition neither Earth, Mars, Jupiter, and Neptune, all of which coexist with several other bodies near their orbits, would make it as a planet. He is also critical of the fact that only about 5% of total 9000 (approx.) IAU members voted in that matter. Other prominent astronomers like Marc William Buie protested against the decision. Since Pluto was re-classified, many studies and researches have been published providing something new in this delicate matter. A research paper published in September 2018 pointed out towards the presence of a more complex geology on Pluto which is more dynamic than most of the other planets in our solar system. Below, we have compiled some of the most interesting facts about Pluto. It all started in the 1840s when many astronomers including Urbain Le Verrier speculated about the presence of an undetected planet which is interfering with the orbits of outermost known planets. Keeping that in mind, a businessman and researcher Percival Lowell founded the famous Lowell Observatory in 1906 and began searching for the mysterious planet which he named “Planet X“. After Lowell’s death, the search was resumed by Clyde Tombaugh in 1929, who was just 23 years old at that time. In classical Greek mythology, Pluto is portrayed as the ruler of the underworld, who first appeared in the Greek literature in works of Plato and other ancient Greek dramas. The name was proposed by Venetia Burney, a schoolgirl from Oxford, England who was greatly interested in ancient mythology. Venetia’s suggestion was channeled through her grandfather, who shared it to an astronomy professor, who then send the name to his fellow researchers at Lowell Observatory in the United States. NASA’s New Horizons, which was launched back in 2006, is the only spacecraft ever sent to explore the cold and distant dwarf planet. The probe encountered Pluto for the first time on January 2015. It took six more months for the New Horizons to make the closest approach to Pluto during which it took several images and other important data. After successful completion of its initial objectives, the New Horizons mission was extended and was tasked to study other nearby Kuiper belt objects (KBOs). 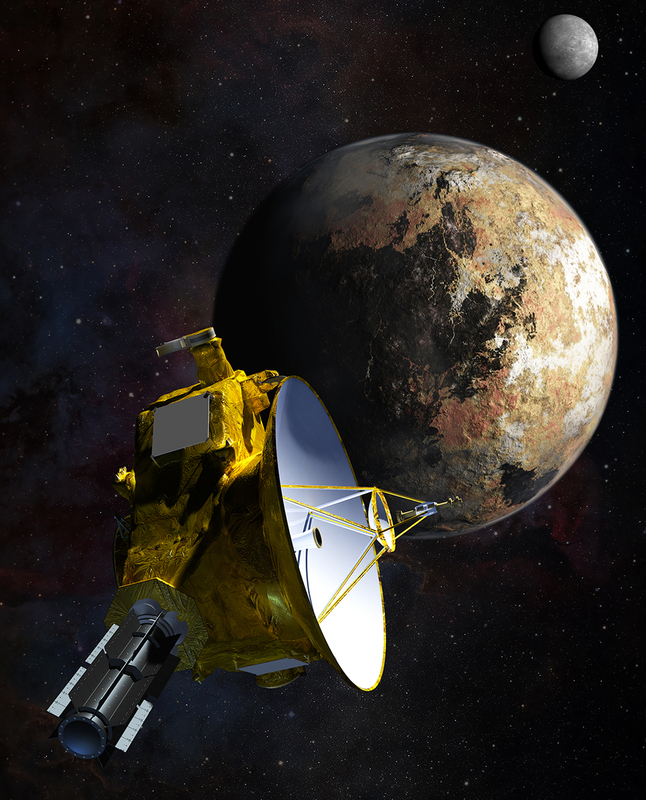 Do you know the New Horizons is one of the farthest man-made objects in the space? It’s currently moving in the direction of the constellation Sagittarius. Following the discovery of Eris in 2005, Pluto became the second-most-massive dwarf planet, while retaining its tag of the largest one in the solar system. This makes Pluto currently the ninth-largest and tenth massive object orbiting around the Sun. The least massive dwarf planet, on the other hand, is Ceres, which was discovered back in 1801. It’s a well-known fact that Pluto is much smaller than all known planets in the solar system but do you know it’s smaller than even some moons or planetary satellites. These moons are Ganymede, Callisto, Io, Europa, Titan, and Triton. Pluto’s diameter of 2376 km is only about 66% that of the Earth’s, while the mass of 1.303×1022 kg is merely about 0.22%. To put things into perspective Pluto’s total surface area is similar to that of Russia. One of the most important discoveries done by the New Horizons spacecraft is the revelation of water ice on Pluto’s surface which is far more prevalent across its surface than earlier thought. These water ice are composed of either nitrogen, methane or carbon monoxide. Its mountains are also made of water ice. Many researchers have hypothesized about a subsurface ocean of water beneath the exposed water ice, which can be possible due to ongoing internal heating on Pluto. However, it’s important to note that it is still not clear whether Pluto has a magnetic field or not. Multiple studies on Pluto’s atmosphere have pointed out towards a possible temperature inversion on the dwarf planet. One such study was conducted back in 2009, which concluded that the average temperature of Pluto’s upper atmosphere (about 100° K) is significantly hotter than its surface. Though, a more recent observation done by the New Horizons mission has shown that Pluto’s upper atmosphere is far colder than earlier anticipated (around 70° K instead of 100° K ). This is most likely due to the presence of methane on the dwarf planet. It was long speculated that Pluto may not have any atmosphere whatsoever due to its small size and vast distance from the Sun. And even if it does, periodic changes in its orbit would gradually freeze its atmosphere into the ground. However, a study based on data received from the New Horizons mission indicates otherwise. According to the research, the dwarf planet is more likely to remain at gaseous state throughout its orbit. Scientists were also able to compute its surface pressure which is around 1 Pa, about 100,000 to 1 million times less than that of the Earth’s. To this date, Pluto is the only known trans-Neptunian object to have an atmosphere. Pluto’s orbital period (time at which it completes one revolution around the Sun) is around 248 years, the longest of all known planets. The dwarf planet also has a unique orbital characteristic. Unlike most of the other planets in the solar system, which orbits the Sun in a flat plane (for reference), Pluto’s orbit is slightly inclined (slightly over 17° relative to the plane). Read: Will We Ever Make It to Stars Outside Our Solar System? A single glance at the orbits of Neptune and Pluto from the top will give an impression that they are due to collide at any time soon but in reality, these two planetary bodies are positioned in such a manner that they can never come dangerously close to each other. However, studies and computer simulations have shown that the situation could change after a long time. One of the reasons why a collision between Pluto and Neptune never took place in the past is due to Pluto’s 2:3 orbital resonance with Neptune: for every three orbits Neptune makes around the Sun, Pluto makes only two. This type of orbital setting prevents planetary bodies from colliding with each other. 6. Unlike most of the planets in our solar system (except Uranus), the entire Pluto-Charon system is tilted on its side due to a much higher axial tilt (more than 120°). This makes seasonal variations on Pluto more violent. About one-fourth of Pluto’s surface remains in permanent darkness, while another quarter remains in permanent daylight. 5. Pluto’s distance from the Earth differs significantly due to its weird orbit around the Sun. At its closest, Pluto is about 4.2 billion kilometers (2.6 billion miles) away, while it’s nearly 7.5 billion kilometers (4.7 billion miles) away from Earth at farthest. It would take slightly less than 10 years for a space probe to reach the dwarf planet as the case with New Horizons. 4. At the distance of 39.5 AU or 5.9 billion km, Sun’s light takes about 5.3 hours to reach Pluto. It (sunlight) is also about 2000 times dimmer on the dwarf planet than it’s on Earth. 3. Pluto’s astronomical symbol ♇ is made by combining the letters of P and L. It stands for the first two letters of the dwarf planet as well as the initials of astronomer Percival Lowell who initially started the search for a planet beyond Neptune. 2. Pluto takes slightly over 6 Earth days (6 days, 9 hours and 17 minutes) to complete one rotation, making it the second slowest rotating planetary object in the solar system after Venus, which takes around 243 days to complete one rotation. On the other hand, the fastest spinning planet in the solar system is Jupiter, rotating once every 10 Earth hours. 1. Many experts and planetary scientists believe that Pluto might just be an escaped moon of the planet Neptune. This hypothesis is greatly fueled by the unusual characteristics of Neptune’s largest moon, Triton which orbits its parent in a retrograde motion: revolving in the opposite direction of the spin of the primary object. While there is currently no known mechanism that could explain the formation of such orbit, it is speculated that a collision between Pluto and Triton in the past could be the reason behind this.